Do paintings get a summer vacation? In the case of Milton Avery’s The Picnic, Vermont, 1940, the answer is “yes.” This outstanding painting is on loan to the Bennington Museum in Bennington, Vermont until November for their exhibition Milton Avery’s Vermont. The only Avery in our collection, it is in good company there with thirteen other paintings by the artist and many more works on paper from the National Gallery of Art among other prestigious lenders. The Picnic, Vermont is typical of Avery’s simplified, post-Fauvist technique in which he uses simplified forms and flat colors, often enclosed in flowing outlines. This particular painting can also be seen as a visual quote of Édouard Manet’s iconic work, Le Déjeuner sur l’herbe (Luncheon on the Grass), 1862–1863. In an essay for the exhibition catalog, Jamie Franklin, curator at the Bennington Museum, writes about The Picnic, Vermont and similar works from this period. They are quintessentially modern, depicting “the Arcadian Vermont landscape…and the leisure activities of a progressive middle class in the northeastern United States escaping the crush of city life and the realities of a world on the cusp of and then during World War II.”* The Picnic, Vermont shows Avery himself, along with his wife, Sally, and friends at what was likely a regular occurrence during their vacations in Vermont: a picnic gathering in the rustic landscape. While the subject is from his own everyday life, Avery’s diligent study of art history lends weight to theory that it is also a purposeful reference to Manet’s iconic work of modern art. *Jamie Franklin, “Green Mountain Idylls,” in Milton Avery’s Vermont (University Press of New England, 2016), 31. As part of an ongoing effort to conserve key artworks in the Gallery’s collection, Juno and Argus, Guardian of the Jupitern Herds was recently restored and is welcomed back for use in teaching and exhibitions. This seventeenth century Flemish painting is of the School of Jacob Jordaens (1593–1678), who was a student of Peter Paul Rubens (1577–1640). 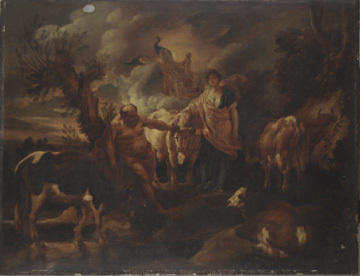 In it is a scene from the story of Jupiter and Io from Ovid’s Metamorphoses. Io, Jupiter’s young, mortal lover, was turned into a beautiful white cow to save her from his jealous wife, Juno. Not fooled by her husband’s trick, Juno captured Io that she might never be turned back into a woman again. 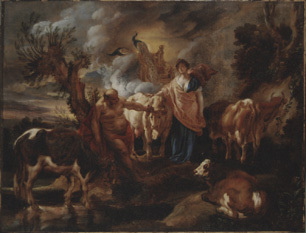 Juno found a hundred-eyed man, Argus, who in our painting holds Io by the horn, to watch over the cow day and night to prevent Jupiter from stealing her. The peacocks atop Juno’s golden stair foreshadow the end of the fable, when Argus is lured into sleep and slain by Mercury, and Juno plucks out his hundred eyes to adorn the feathers of her beloved bird. This fable was painted by both Rubens and Jordaens, and their influence on the artist of our painting is clear in both choice of subject matter and the billowy, baroque handling of Juno’s clothing and Argus’s flesh. The conservation treatment was performed by Cynthia Stow of Cumberland Art Conservation, Nashville. The painting was cleaned, inpainted where there were losses, and secured with archival backing. Funds for conservation of this and other artworks in the Fine Arts Gallery’s collection were provided by the Kathryn and Margaret Millspaugh Fund for Art Conservation.